LOS ANGELES - Oct. 29, 2018 - PRLog -- November is National Native American Heritage Month, and Leomark Studios is releasing Leftwood Pictures' The Women In the Sand on Amazon Instant Video and as a DVD for purchase through major online retailers on November 16. 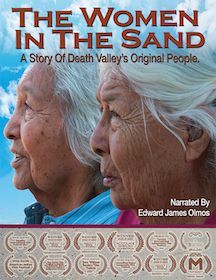 The Women in the Sand is a documentary about two feisty elders of Death Valley's Timbisha Shoshone Tribe and their struggle to preserve their language and culture. The Women in the Sand (http://leomarkstudios.com/wits.html), an official selection of the 2017 Red Nation Film Festival, was given a special screening and received a standing ovation at AMPAS' Pickford Center for Motion Picture Study's Linwood Dunn Theater in Hollywood. It was nominated for Best Feature at the 2017 TMC London Film Festival and awarded laurels from Impact Docs Awards and Accolade Global Film Competition. The Women in the Sand was an official selection of the 2018 Toronto Independent Film Festival. Last May, the film screened at the U.S. Capitol Visitors Center for the House Natural Resources Committee, which serves the Federal Departments of the Interior, Energy, and Homeland Security, as well as the Environmental Protection Agency. Leomark Studios (http://leomarkstudios.com), the U.S. distributor and international sales agent for The Women in the Sand, will be at the American Film Market, Oct. 31–Nov. 6 in Loews Santa Monica Beach Hotel, Room 329.